The jumbo bodied F-55 (formerly F-50R) produces an extraordinary amount of volume and warmth, matching a tight grained solid Sitka spruce top with solid Indian rosewood back and sides for extraordinary separation and clarity. Its strong, focused bass response, sweet, singing mids, and crisp highs give it a distinctive voice that sets this guitar apart from all others. Elegant cosmetic appointments include the classic Guild “V-block” inlays, gold Gotoh hardware, and a beautiful Nitrocellulose lacquer finish. Exceptional build quality and premium specifications make it a worthy heir to the historic Guild jumbo legacy. 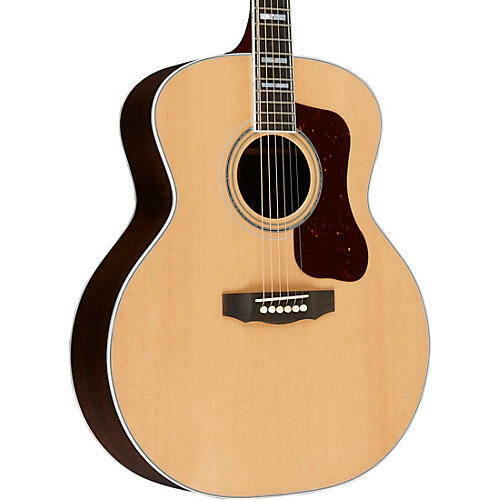 Each F-55 Jumbo includes a Guild wood case with a built-in Humicase humidification system.